Every company, of every size, in every corner of the globe collaborates at some level. At one end of the spectrum lies tactical communication and coordination between people, teams, partners and customers. The other end of the spectrum is reserved for those who are Collaborating with a “big C” – in other words, who have established the tools, process and culture, and who have optimized their environment for Collaboration. Those charged with enabling enterprise Collaboration – namely vendors, IT teams, and industry technologists – have all been overly successful at driving an increasing volume of interaction. As a result, many end users are most certainly collaborating more. The question is... are we collaborating better? The answer is often an emphatic “NO!” When polled, most end users express collaboration fatigue, an exhaustion driven by volumes and volumes of collaborative information. Those enterprises that are Collaborating with a “big C” point to technology as one component in their collaboration strategy – albeit an important one. 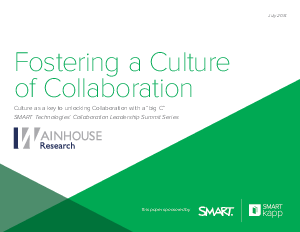 In order to maximize the effectiveness of today’s advanced collaboration solutions, enterprises must establish a culture of collaboration, back that culture up with appropriate process, and then deploy technologies that support the enterprise’s Collaboration vision. The real question here is “how” - how does an enterprise truly change its culture to embrace Collaboration with a capital C? This paper is the second in a series of publications that explore the insights gathered from the SMART Technologies Collaboration Council. Here we summarize the Council’s views on the criticality and steps towards of establishing a Collaborative culture.